Staying at one these wonderful homes in the country will be a treasured memory for many years. Driving up to this beautiful property through the grove of trees takes you first to Enchanted Porch—a large frame and rock house bordered by a wrap around porch. The outside of this property is truly a delight with not only the porch but also a rock patio with comfy seating, grill and great views. Bird feeders bring the birds and hummers up close and personal. Driving past Enchanted Porch through two gates leads you to the second property- Grandmother’s Porch. This lovely home also has a wrap around porch with wonderful seating areas and provides great views of the countryside. Inside this spacious home is the living/dining room with it’s cathedral ceiling. The focal point in the living room is the rock fireplace. Reclaimed long leaf pine floors are throughout the home. A sofa and chairs are placed to not only enjoy the fireplace on a cold winter night, but also the flat screen television with DVD and selection of movies plus a game table. A large round table in the dining room is convenient to the open kitchen just steps away. The kitchen is fully furnished. Off of the kitchen is the utility room and half bath, which is also entered from the hallway downstairs. There are two bedrooms downstairs offering a king bed in one bedroom; the second bedroom has a queen plus bunk beds. The bath downstairs has a shower with jetted tub (plus the half bath in the utility room). Upstairs are two more bedrooms. The third bedroom has a king plus a futon that will sleep one or two persons. The bathroom has a shower. The fourth bedroom (loft) has a bunk bed with double sleeping on the bottom plus a trundle and a sofa. The bath upstairs bedroom has a shower. This home is both comfortable and nicely appointed. There is much to do and see in this wonderful home. Outside is truly an adventurer’s delight. Hike down to beautiful Bee Creek (seasonal) or cool your heels in Polander Creek (wet year round). 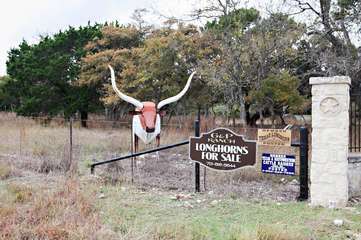 Several longhorns make their home on this 63 acres of pastureland. Some of their names are Bangs, Little Liza, Claret, and Sweet Horseshoe J. KITCHEN - Fully-equipped kitchen with gas stove/oven, large refrigerator, microwave, coffeemaker, dishwasher, etc. BREAKFAS - No breakfast. Coffee and teas are provided. SLEEPS - Up to 14 persons- downstairs has king, queen and bunk bed, upstairs has a king, futon, bunk bed (double on bottom bunk), trundle bed under bottom bunk, queen size inflatable mattress available on prior request. Located just walking distance to and behind Enchanted Porch, this spacious home is perfect for a group get-away or to add to your group staying at Enchanted Porch. Grandmother’s Porch also has a wrap around porch both inviting and comfortable. Inside is an open living/dining and kitchen. The spacious living room has wonderful large windows and updated flooring to bring in our great Texas sunshine plus a large sleeper sofa and three comfy chairs all placed to enjoy the Satellite TV/DVD/VCR or just to enjoy the potbelly stove on those cold winter days. The dining room has dining table open to the fully equipped kitchen. The downstairs bedroom has a king Tempur-Pedic king size bed. A shower is found in the downstairs bath. Upstairs are two bedrooms—one with two queen beds and the other with a king bed plus a daybed. The bath upstairs has a tub with shower. A small study/TV room is also found upstairs. The library room has two twins beds and a library of books for you to enjoy during your stay. KITCHEN - Fully-equipped kitchen with electric stove/oven, large refrigerator, microwave, coffeemaker, dishwasher, etc. BREAKFAST - No breakfast. Coffee and teas are provided. SLEEPS - Up to 13 persons- downstairs has king in the master and sleeper sofa in the living area, upstairs second bedroom has a king and day bed and the third bedroom has two queens, the library has two twins. AMENITIES - Central heat/air, potbelly stove, basic Satellite TV with VCR/ DVD & movies, fully-equipped kitchen, washer/dryer (no detergent provided), WiFi, wrap around porch, propane grill, outside firepit on rock patio wood provided, but not available during burn ban). 15% Military, First Responder, and Teacher Discount w/ I.D. The entire process from booking to checkout was done with ease. The property and accommodations were amazing and so relaxing. Our group of 14 had two unused bedrooms so everyone had plenty of space. The property is very well kept and has everything you and your group needs to have an enjoyable and relaxing stay. From drinking coffee in the morning on the wrap around porch watching the hummingbirds and other wildlife to cooking on the outside grill this property is definitely one of the best. If you choose this property you won’t be disappointed! Thanks again for a great experience!